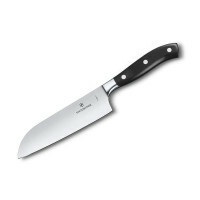 This Santoku knife is an excellent all-rounder. 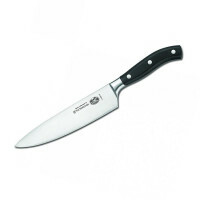 Victorinox are some of our best-sellers, and have a reputation in numerous restaurants and commercial kitchens for being consistently sharp, durable and reliable knives. 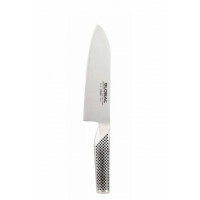 This Santoku knife is an excellent all-rounder, with a 17cm blade that is the perfect shape for slicing, dicing and chopping and a Fibrox nylon handle for a comfortable grip. Victorinox - the makers of the original Swiss-army knife since 1884, have grown their range to include everything from luggage (available in our Variety department) to world-class cutlery and kitchen knives. While this Victorinox knife is dishwasher safe, it is recommended that knives are always washed only by hand to preserve the sharp edge.